I saw this recipe in the November issue of Whole Living Magazine and I knew I had to make it. I mean I was literally salivating over this recipe and 5 others. These recipes were shown as Thanksgiving side dishes for vegans and vegetarians. 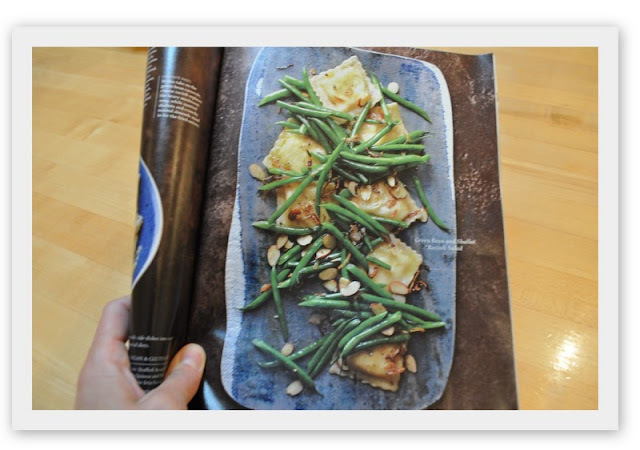 I thought to myself as I was staring longingly at the photos, when did I start getting excited over vegetable dishes? Who is this girl? I use to get excited over a juicy burger, fries or any sort of sweet, (well, I still get excited over sweets) but vegetables? This is all recent and very strange for me. I’m honestly considering becoming a vegetarian. I would prefer a beautiful homemade (not those frozen things) veggie burger to a beef or turkey burger any day. I’m more excited to eat the veggies that I am going to prepare for Thanksgiving than the actual turkey. My taste buds are definitely changing, maybe its California and that fact that the produce here is so unbelievably fresh and delicious.One thing I love about this recipe is that it’s another easy pantry pasta. All I had to purchase was the green beans, as I had some shallots, almonds and ravioli at home and I grabbed a fresh lemon from our lemon tree. I’m finding that if you keep a well stocked pantry, all you need to do is run out for the fresh vegetables. Onions, shallots, nuts, squashes and pastas keep for some time, so stock your pantry with them and you will always have them on hand when your inspired to create a yummy last minute recipe. If green beans aren’t in season, no worries, you can substitute broccoli rabe instead. Eli and Zoe rated this dish a 10+++. John and I literally devoured it, so it ranked high with us as well. This is definitely a recipe that is going to be made again and again in our house. Moms, this is an easy throw together pasta for those busy weeknights. 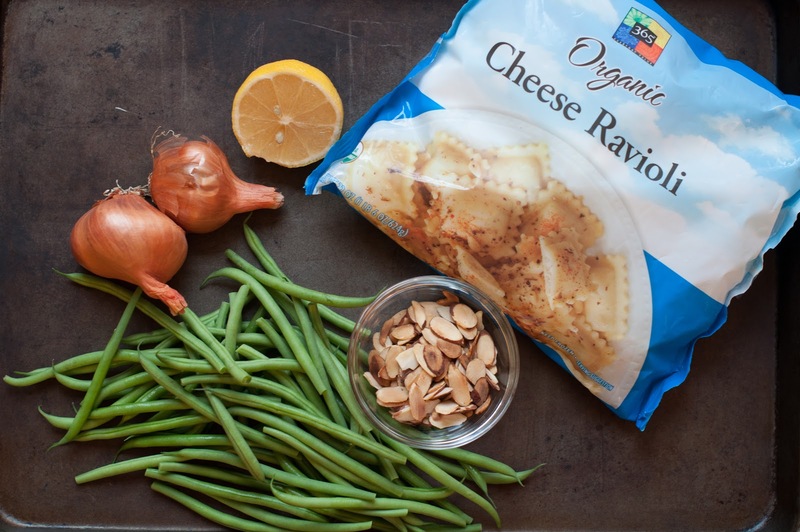 1 bag (22oz) of frozen ravioli – I get the Whole Foods ravioli as it’s just $2.99 a bag, what a steal! 2 tablespoons sliced almonds, toasted – I just throw in a big old handful and call it a day. First toast up the sliced almonds. To toast them, just put some sliced raw almonds in a dry skillet set over medium heat, and swirl them around in the pan for a few minutes until they become golden brown in color. Reserve them to the side. Next wash up and trim those green beans. Aren’t they just beautiful? They’re so vibrant and green. I tell you, mother nature makes the most beautiful food. 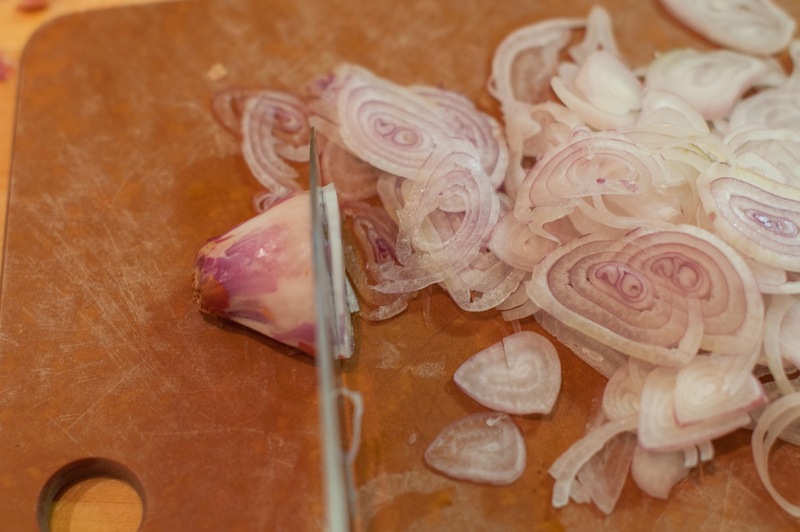 Peel and slice your shallots into thin slices, set aside. 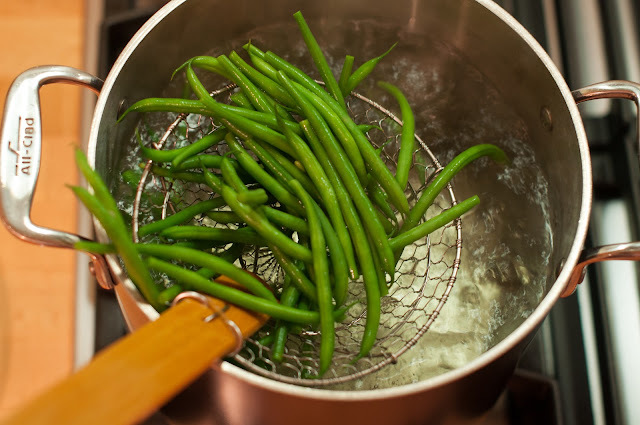 Bring a large pot of well-salted water to a boil.Throw the beans into the salted and boiling water, (you’re basically blanching them) and cook the beans until just tender 3-5 minutes (depending on the size of your green beans). I always cook my beans for exactly 3 minutes and they are perfect! If you’re using broccoli rabe, then you will only want to cook it for 1 minute. Note: Timing can vary depending on the size of your vegetable. There is only one sure way to tell if your vegetable is done: put it in you mouth and eat it. Transfer the beans with either a slotted spoon or mesh strainer to a bowl of ice water, to stop the cooking of the beans. Drain the beans, dry them off, and then set them aside. Add the ravioli to the cooking water, (the same water that you used for the green beans) and cook according to package directions. Drain and set aside. Meanwhile, heat the 2 tablespoons olive oil in a large skillet over medium-high heat. Add the shallots and cook until golden and crispy, about 3-5 minutes. 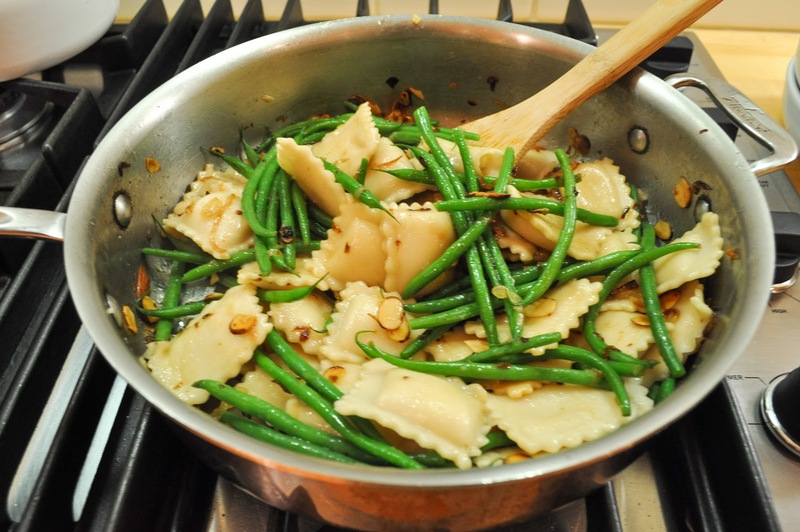 Add the green beans, ravioli and almonds to your pan and toss to coat. I like to turn the heat down to low and cook the ravioli for a minute or two so that it browns up a bit. Turn off the heat, take your lemon half, and squeeze the juice over the pasta. Serve up the pasta into individual bowls and add some fresh shredded parmesan. Make sure to scrape all those goodies off the bottom of the pan. 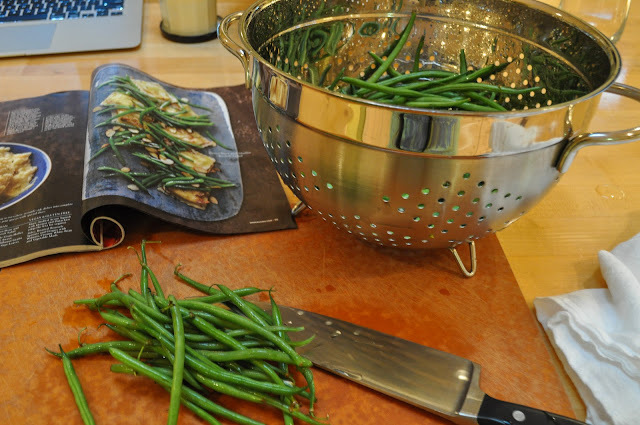 1 large bunch of green beans, trimmed - We like our veggies, so I grab a hefty bunch. If green beans aren't in season, feel free to substitute broccoli rabe. 1 bag (22oz) of frozen ravioli - I get the Whole Foods ravioli as it's just $2.99 a bag. 2 tablespoons sliced almonds, toasted - I just throw in a big old handful and call it a day. Next wash up and trim those green beans. 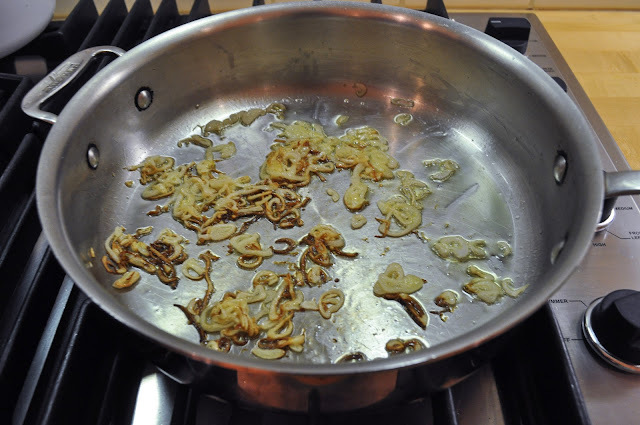 Peel and slice your shallots into thin slices, set aside. 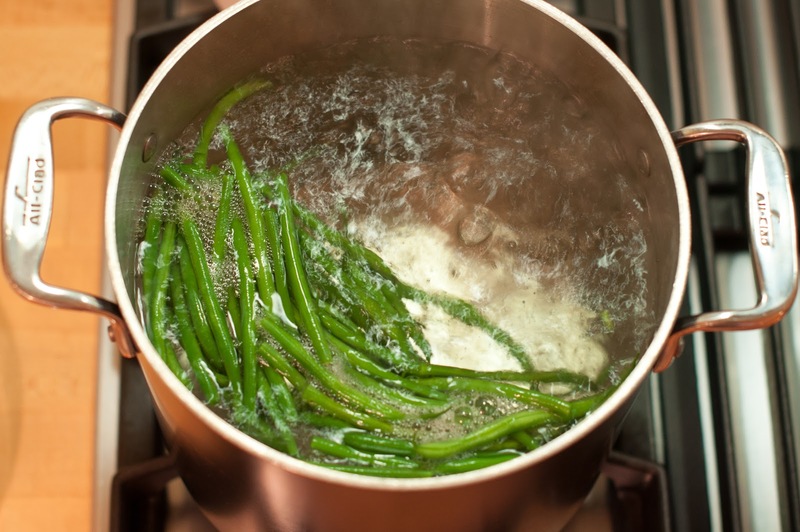 Bring a large pot of well-salted water to a boil.Throw the beans into the salted and boiling water, (you're basically blanching them) and cook the beans until just tender 3-5 minutes (depending on the size of your green beans). I always cook my beans for exactly 3 minutes and they are perfect! If you're using broccoli rabe, then you will only want to cook it for 1 minute. Note: Timing can vary depending on the size of your vegetable. There's only one sure way to tell if your vegetable is done: put it in you mouth and eat it. 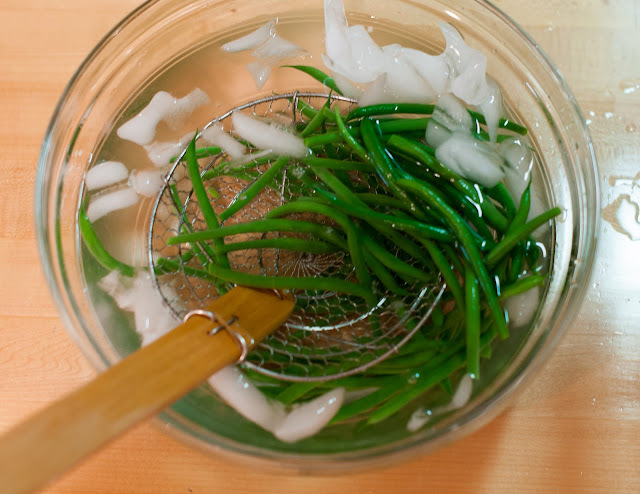 Transfer the beans with either a slotted spoon or mesh strainer to a bowl of ice water, to stop the cooking of the beans. Drain the beans, dry them off, and then set them aside. Meanwhile, heat the 2 tablespoons olive oil in a large skillet over medium-high heat. Add the shallots and cook until golden and crispy, about 3-5 minutes. Add the green beans, ravioli and almonds to your pan and toss to coat. I like to turn the heat down to low and cook the ravioli for a minute or two so that it browns up a bit. Turn off the heat,take your lemon half, and squeeze the juice over the pasta. Serve up the pasta into individual bowls and add some fresh shredded parmesan. Make sure to scrape all those goodies off the bottom of the pan. I made this recipe tonight and my husband liked it so much he licked the plate (really). Thanks for an easy and quick – yet delicious – recipe! made this tonight! loved it! 🙂 thanks! Thanks for sharing. Made this last night to try something different with the overabundance of beans from my garden. It was a huge hit! Hi Megan! Thanks for trying the recipe! I am so glad you liked it and made use of all your green beans. It’s such a simple and tasty recipe! Yaaay! Glad the family liked it girl! Love you to! Momma Marin! I made this tonight and had a happy family. Raffes doesn’t count because her palate is tres selective. Love it. Love your blog. You will love this recipe Deb! It’s right up your alley!